create a beautiful landscape and an inspiring ecosystem. Learning about the diverse vegetation, rich soil conditions, native animal populations, and land management of the precious Tallgrass prairie inspired these painterly landscapes with a modern twist. 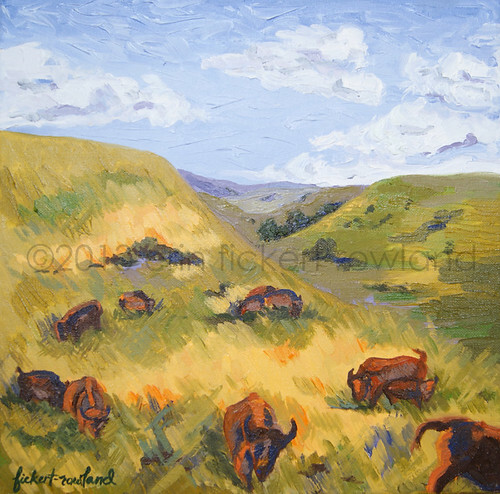 Each painting features a dynamic composition, lush color, richly painted texture, and highlights a key component of the Flint Hills ecosystem. Once numbering 60 million, herds of Bison were a crucial component of the Tallgrass Prairie ecosystem. Their specific grazing preferences enhance the prairie landscape. Populations were decimated by humans, but are now being successfully reintroduced. A graphic interpretation of the 70-80% of the Tallgrass Prairie's biomass that exists underground. A dense network of deep roots creates extremely rich soil for the prairie ecosystem. This rich soil is highly valued by farmers, as it produces bountiful crops. 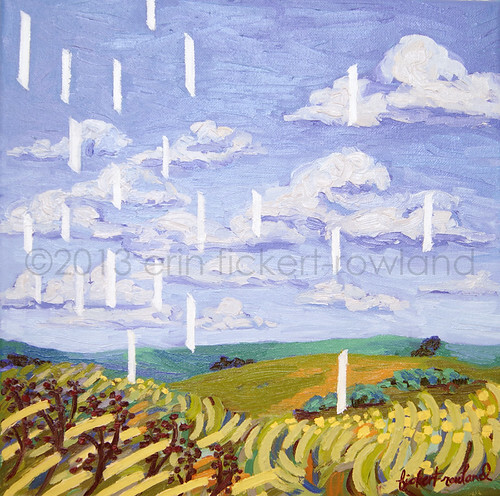 An abstracted interpretation of the Tallgrass Prairie landscape, where the ecosystem thrives because of the healthy relationships between vegetation species and environmental conditions. 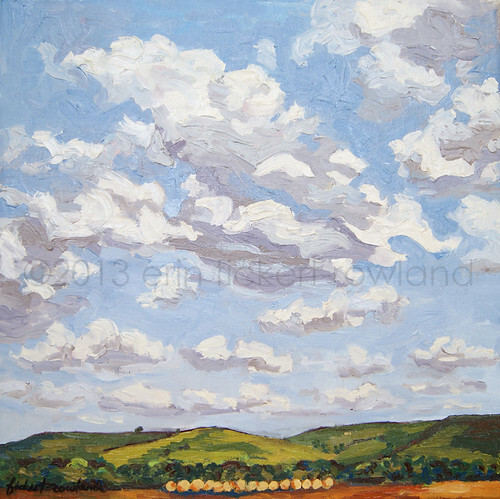 An expansive sky of quickly moving clouds over recently mowed prairie grasses in the Flint Hills of Kansas. "Haying" is a method of controlling growth of dominant grasses and encouraging plant diversity in the landscape. 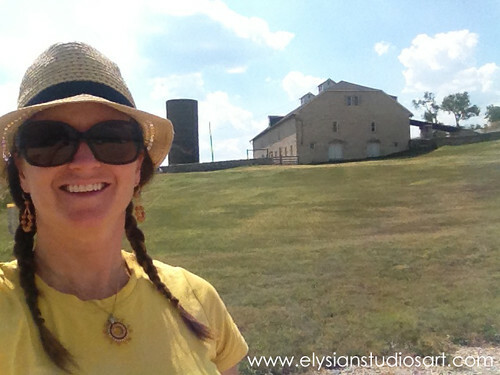 Though I am an artist working in the Denver, Colorado area, I recently had the opportunity to visit the Flint Hills on a trip to see family. I was deeply impressed by this beautiful land and the importance of its preservation and restoration. 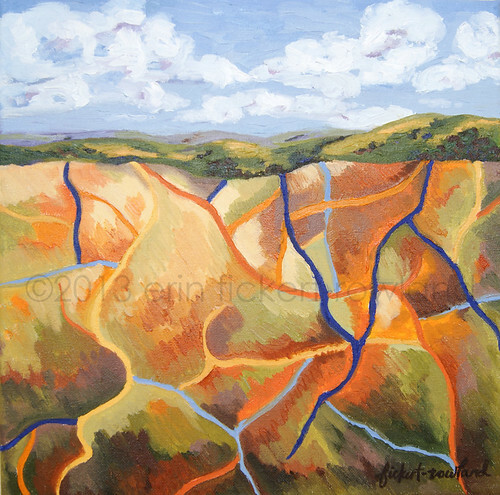 I explore both traditional and abstract imagery in my art, and I wanted my paintings of the Flint Hills to reflect my passion for this unique landscape. I believe art should be an expression of both nature and the artist, so I have used traditional techniques to create imagined scenes which are true to nature yet have creative graphic elements specific to my own vision. Here I am on site working on sketches and collecting photographs and research before starting the paintings back in the studio!